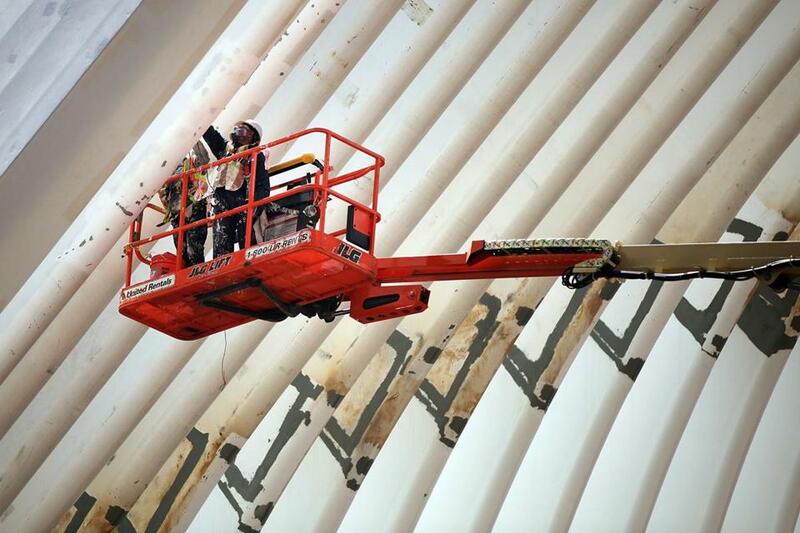 Workers at the World Trade Center complex, which is nearing completion in lower Manhattan in New York City. The economy is showing signs of heating up again after a brutal winter in many parts of the United States brought growth to a standstill in the first quarter. Employers added 280,000 jobs in May, the biggest monthly increase of 2015, the Labor Department reported Friday. Combined payroll gains were revised upward for the previous two months, wages rose 2.3 percent from a year earlier, and long-term unemployment fell to 2.5 million, down from a peak of 6.8 million in 2010. “Job growth roared back to life in May,” said Scott Anderson, chief economist at Bank of the West in San Francisco. The economy shrank 0.7 percent annual rate in the first three months of the year, a drop economists blamed on the impact of unusually cold weather, work slowdowns at some US ports, and falling energy prices. Economists said the latest payroll numbers, which exceeded their forecasts, indicate that the slowdown was temporary and the US expansion is back on track. The economy is expected to grow about 2.5 percent this year, according to the average forecast of 82 economists surveyed by Bloomberg. Stocks closed mixed Friday on concerns the Federal Reserve will raise short-term interest rates later this year, perhaps as early as September, to help keep the economy from overheating and sparking inflation. Fed policy makers meet again on June 16 and 17, but most analysts expect them to leave the central bank’s benchmark rate near zero, where it has held since the end of 2008. The Dow Jones industrial average fell 56 points, to 17,849, and the broader Standard & Poor’s 500 index slid 3 points, to 2,093. The technology heavy Nasdaq Composite rose 9 points to 5,068. Interest rates on government bonds also rose, indicating that higher business and consumer lending rates could be coming as the economy improves. The unemployment rate, which is calculated from a separate survey of households, rose to 5.5 percent, from 5.4 percent in April, but the increase was largely due to more Americans resuming job searches, a sign they are more confident in their prospects. The official unemployment rate does not include people who don’t actively look for work. The Massachusetts unemployment rate was 4.7 percent in April. The state releases unemployment statistics for May in about two weeks. Jim O’Sullivan, chief US economist at High Frequency Economics, a forecasting firm in Valhalla, N.Y., described May’s job growth as “strong.” He said the nation is approaching “full employment,” a condition in which almost everyone who wants a job can get one and generally considered by economists as a jobless rate between 5 and 5.5 percent. “Employment growth is more than strong enough to keep the unemployment rate coming down,” O’Sullivan said. Job growth was broad-based last month spread across nearly all the major sectors tracked by the Labor Department. Sectors that play key roles in the Massachusetts economy, such as health care and professional and technical services, posted sold gains nationally. For some pockets of the economy, however, problems remain. Nearly half of the growth in jobs was in low-wage sectors, such as retail, leisure and hospitality, and temporary help services. The unemployment rate for 18- to 29-year-olds, is about 9.1 percent, according Generation Opportunity, a Washington nonprofit that advocates for young Americans. A broader measure of unemployment that includes workers who have given up job searches and those employed part-time because they can’t find full-time jobs was nearly 11 percent in May. In a recent speech in Connecticut, Eric Rosengren, president of the Federal Reserve Bank of Boston, cited these workers as evidence that the labor market, while improved, is weaker than the official unemployment rate would suggest. He called on Fed policy makers to be patient and wait for the economy to gain more strength before raising rates. Since the end of the winter, the economy has grown moderately, according to a recent Fed survey. Despite steady job gains, consumer spending which accounts for more than two-thirds of US economic activity, has been lackluster, economists said. A strong dollar is hurting the nation’s exports, since foreign buyers must now to pay more for American goods.